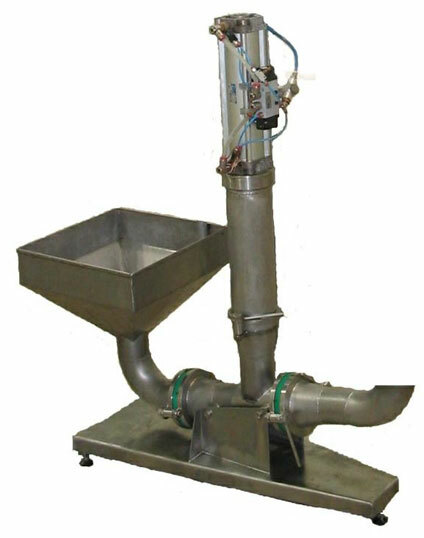 The giblet pump is designed mainly for transporting chicken gizzards, hearts, livers and necks. The giblet pump is made of stainless, acid-resistant materials and plastic. Parts to be transported are dropped into the charging hopper and, by means of piston movement, they are pushed through a system of flap valves to a piping system, and further to the distribution point. For proper functioning of the pump, water must be added to giblets all the time. When transporting gizzards, livers, hearts or necks, it can be ice water, which results in the additional effect of chilling the parts if they are transported over long distances. From the distribution point, giblets can be transported for as long as 80 m, in Ø89 stainless steel pipes or PCV pipes. When transporting edible parts, they should be directed to special separation screens for draining water. When transporting offal, it should be directed to waste separator or waste screen. Pump capacity: up to 9,000 single parts, i.e. 9,000 gizzards, livers, hearts or necks.